As persons grow older, they become prone to decline and breakdown of a wide variety of body and mental systems. The tendency to become depressed and pessimistic -- as well as to begin suffering brain dementia of various types -- grows in frequency. 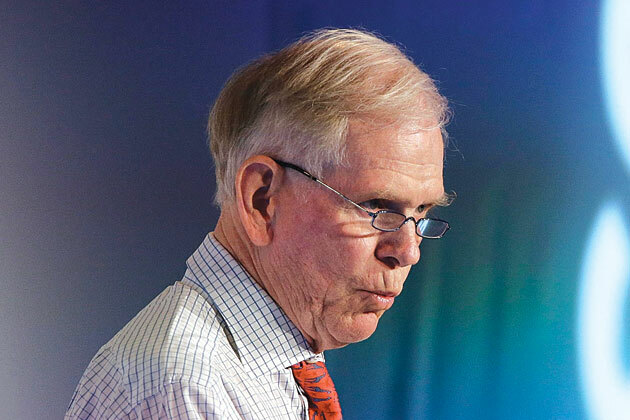 Such a decline in logical clarity is beginning to show in the works of asset manager Jeremy Grantham, recently called to task by the Canadian polymath Vaclav Smil. Jeremy Grantham, a well-known presence in the financial world, recently published a World View column in the journal Nature in which he concludes that, “simply, we are running out’’ of almost all commodities whose consumption sustains modern civilization. There is nothing new about such claims, and since the emergence of a vocal global peak oil movement during the late 1990s, many other minerals have been added to the endangered list. Indeed, there is now a book called Peak Everything. What makes Grantham’s column – published under the alarmist headline “Be Persuasive. Be Brave. Be Arrested (If Necessary)” – worth noticing, and deconstructing, is that he puts his claims in terms more suitable for tabloids than for one of the world’s oldest and most prestigious scientific weekly magazines. His direst example is “the impending shortage of two fertilizers: phosphorus (phosphate) and potassium (potash). These two elements cannot be made, cannot be substituted, are necessary to grow all life forms, and are mined and depleted. It’s a scary set of statements…. What happens when these fertilizers run out is a question I can’t get satisfactorily answered and, believe me, I have tried.’’ Well, he could have tried just a bit harder: an Internet search would have led him, in mere seconds, to “World Phosphate Rock Reserves and Resources,” a study published in 2010 by the International Fertilizer Development Center (IFDC) and funded by the U.S. Agency for International Development. This detailed assessment of the world’s phosphate reserves (that are the part of a wider category of resources that is recoverable with existing techniques and at acceptable cost) concluded that they are adequate to produce fertilizer for the next 300 to 400 years. As with all mineral resource appraisals (be they of crude oil or rare earths), the study’s conclusions can be criticized and questioned, and the statement by the Global Phosphorus Research Initiative is perhaps the best document of that kind. But even the most conservative interpretation of IFDC’s assessment shows that phosphates have a reserve/production ratio well in excess of 100 years, higher than that of many other critical mineral resources. Even the most conservative interpretation of IFDC’s assessment shows that phosphates have a reserve/production ratio well in excess of 100 years, higher than that of many other critical mineral resources. The simplest explanation for such mental sloppiness on Grantham's part, would be the early onset of dementia -- not terribly uncommon at his age. But this association of doomerism with a confused "tunnel vision" thought style is common among doomer groups -- including those who obsess over religious doom, peak oil doom, climate catastrophe doom, overpopulation doom, or any of a wide range and large number of fashionable dooms that occupy aging minds. As they see their own body systems falling apart, and as their friends and family members fall by the wayside year after year, it is natural for persons to project the sense of their own impending doom onto the world at large. A large number of websites have been set aside for such persons to commiserate with others of their ilk. This may keep them out of greater mischief, which should be seen as a blessing by society at large. There is certainly a good deal of money to be made from these unfortunate individuals, for the unscrupulous huckster willing to take advantage of their gullibility. And it is possible that Jeremy Grantham -- rather than being a victim of dementia himself -- is actually one of the unscrupulous hucksters seeking to take advantage. Your best bet would be to avoid risking your assets with anyone who would make you wonder about his mental competence, by being unwilling to verify the facts behind his more controversial public assertions.